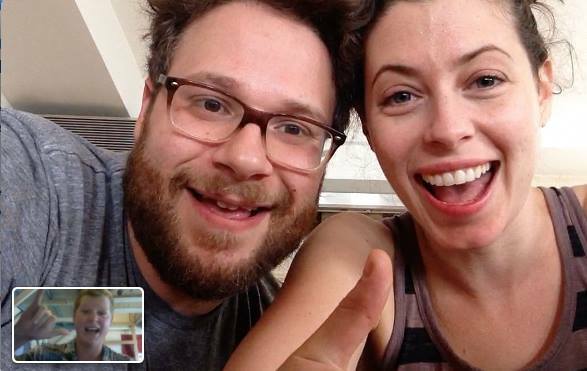 Santa Clara University student David Guibord (bottom left) video chats with Seth Rogen and his wife, Lauren Miller, after raising over $21,000 for HFC U. 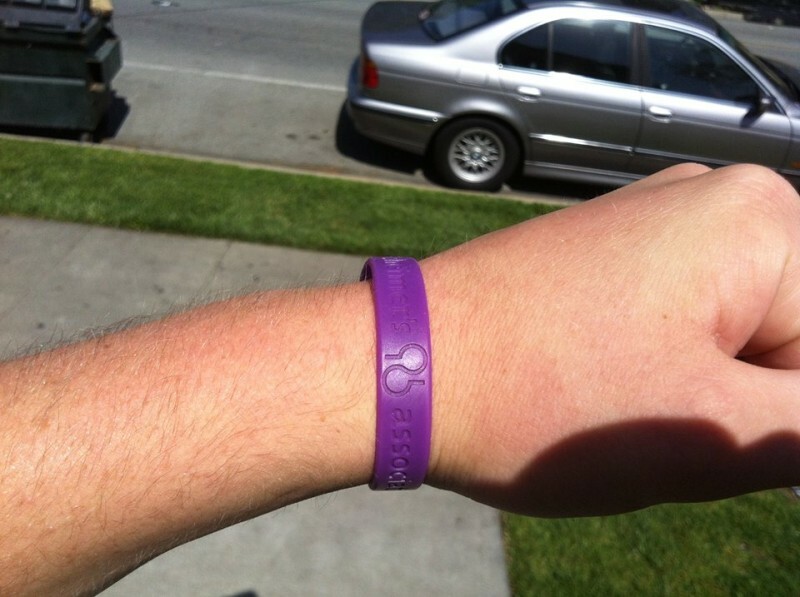 The purple Alzheimer’s Association wristband that David Guibord sold to the students at Santa Clara University. David Guibord on his father's shoulders..
As patients with Alzheimer’s disease suffer losses in their independence, their families who care for them suffer as well, experiencing substantial emotional, financial and personal costs. Even still, many patients and families delay seeking help that might reduce this suffering. Public health professionals are attempting to tackle this by publicizing warning signs about the symptoms, and prompting doctors to speak with their patients about cognitive health. Much of this outreach has primarily been aimed towards the at-risk generation, the Baby Boomers. However, the conversation about Alzheimer’s excludes a fundamental part of the population— young people. The young may see Alzheimer’s as a distant problem, but they are part of the families who live with and suffer from Alzheimer’s disease. Seth Rogen, a comedian, writer and actor, recognized the need for young adults to join the fight against Alzheimer’s. Rogen is famous for writing and starring in the popular comedies such as “Knocked Up,” “Pineapple Express,” and “This Is The End.” His signature crude humor and bawdy comedy are staples in youth popular culture. After witnessing his mother-in-law’s progression of early onset Alzheimer’s, he was driven to become involved in Alzheimer’s advocacy. Rogen found that the youth were painfully unaware and uneducated about the reality of Alzheimer’s. “It is not a high priority for many young people…[and young] people do not understand it is not their grandparents being affected, it is their parents being affected and soon enough it is them being affected,” said Rogen, testifying to a Senate panel on the need to increase funding for research. To remedy the youth’s disregard of Alzheimer’s, Rogen is utilizing his iconic image as a means to rally support amongst college students. 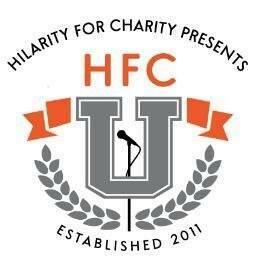 Rogen’s Hilarity for Charity, a nonprofit formed in 2011 advocating Alzheimer’s research, education and support, now sponsors HFC University—or HFC U—a program to raise funds and awareness on college campuses. HFC U facilitates variety shows, Instagram scavenger hunts, dance-a-thons, and original events at over 120 campuses across the nation. The goal is to raise money in a funny, upbeat setting. In the spring of 2014, its opening semester, HFC U raised over $130,000 for Alzheimer’s research. The two highest-performing 2014 HFC U fundraising events took place at the University of Vermont, lead by John Fox, and at Santa Clara University, organized by David Guibord. Together, these two teams raised over $48,000. These HFC U events were the first Alzheimer’s awareness events on the two campuses. They not only raised money, they got the students talking about Alzheimer’s disease. Through HFC U, John and his eighty fraternity brothers decided to host a talent show. At first, their fundraising was slow; Alzheimer’s fundraising was a new cause on campus and not many people had discussed the disease before. Many young people keep their experiences private because “they might be embarrassed, ashamed or don’t think anyone can relate to them,” says John. Once John confided in his friends and peers that his grandfather had passed away from complications of Alzheimer’s, “more people started to share their own [stories]. People you never would have expected were affected by the disease,” he says. HFC U “planted the seed to get people talking” about the disease and revealed “a lot of people related to the cause.” Soon, family members, friends, and strangers enthusiastically donated and joined in the spirit; one of John’s friends even encouraged contributions by promising to perform a jazzercise routine if they reached $10,000. “[Fundraising for Alzheimer’s] was not about Seth Rogen, it was about helping my family and other people in the same situation,” John explains. His fraternity far surpassed their starting goal of $5,000, by raising over $27,000. Considering the students’ disconnect at the beginning of the fundraiser, John was “shocked at the turnout” of 600 students who attended the HFC U talent show. David’s HFC U event at Santa Clara was also motivated by personal experiences. 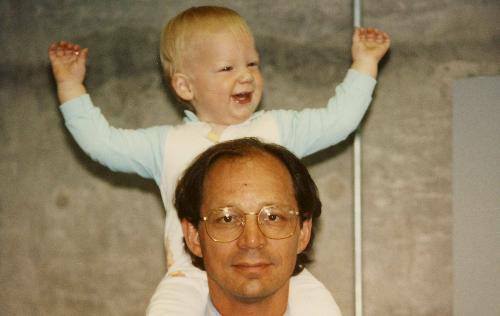 While David was in college, his father died of early onset Alzheimer’s. HFC U provided him with a chance “to actually do something about this terrible disease.” His friends had supported him throughout his father’s decline and many students were already familiar with his story. Like John’s fundraiser, personal and emotional connection played an important role in motivating people to become involved. David recognized that several other factors also contributed to the success of the event. He explains how Seth Rogen’s association with the charity sparked the interest of many students at Santa Clara because “there was a friendly face supporting it and a celebrity involved.” In addition to Rogen’s star power, David used another strategy to gain support within the student body. He knew there was one foolproof way to convince upperclassmen to attend an event: have an open bar. So that is what he gave them. To enter his party, one needed to purchase a purple Alzheimer’s Association wristband, which David sold to fraternities, sororities and clubs on campus for five dollars. The students were excited to party for a good cause. With the help of online donations, David raised over $21,000 for HFC U. Engaging all generations to care about Alzheimer’s will help not only the patients and families living with it, but it might also begin to reshape how we approach age in our society. Engaging all generations to care about Alzheimer’s will help not only the patients and families living with it, but it might also begin to reshape how we approach age in our society. Historically, old age has been indoctrinated as something to be embarrassed about. One of the main reasons there is a stigma surrounding Alzheimer’s is because of society’s negative view about and fear of aging. To make meaningful headway in Alzheimer’s awareness, our culture must be talk about growing older and the diseases older adults experience. The time has come to consider Alzheimer’s a problem that transcends age. Natalie Weiss was a Summer 2014 intern with Making Sense of Alzheimer’s, when she was an undergraduate student at the University of Pennsylvania, majoring in Mathematical Biology with a minor in International Development. For Susan and John McFadden, dementia-friendly communities are a natural expression of caring values. The actor stops. "Where was I going with this?" he thinks to himself.